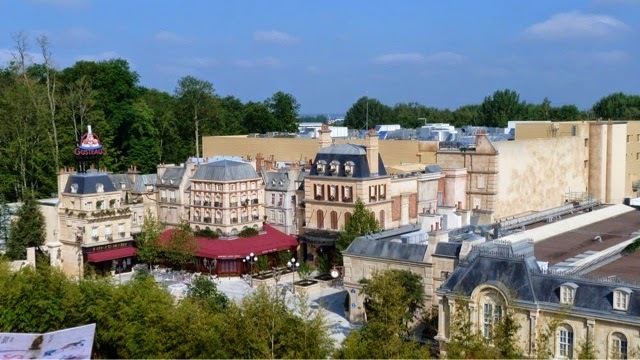 DLP WDS Ratatouille Ride Official Press Release ! Updated with both English AND French Versions ! We're June 1st, 2 a.m, and here is the official press release of Disneyland Paris for the Ratatouille attraction, with new pictures of inside the ride! The culinary world of the Disney Pixar film Ratatouille comes to life in RatatouilleL’Aventure Totalement Toquée De Rémy, a first of its kind Disney attraction that uses trackless ride vehicles matched to an enormous 3D projection system featuring original animation from Pixar Animation Studios. Guests shrink down to the size of a rat and join Rémy, the “little chef” from the film for a crazy culinary adventure that sends them scurrying through the kitchen, dining room, and walls of Gusteau's famous Paris restaurant. The adventure begins when guests become rat-sized and board a « ratmobile », a vehicle that looks like a cute version of the furry rodents from the film. Soon the ratmobiles are on a Paris rooftop where they encounter Rémy and the ghost of Gusteau as they discuss the special mealRémy wants to prepare in guests’ honor. Moments later, Rémy’s excitement leads to him and the ratmobiles plummeting down to the kitchen floor of Gusteau’s restaurant. Being rats in a human world is fraught with danger, so Rémy and his new friends in the ratmobiles have to quickly move out of sight before Chef Skinner spots them. Rémy leads the way as all of therats move from one tight hiding place to another. Luckily, Rémy’s human pal Linguini is there to help. Guests will discover a vehicle that is, shall we say, a little unusual, letting them enjoy the experience as though they were the size of our lovable little rodents. Welcome to theratmobile! Specially designed by our Imagineers, this strange and amazing car, which will make all real rodents green with envy, comes in five colours. It is great for families since it holds six passengers. The ratmobile travels in groups of three, but like real rats, none of them follows the same route. They move using a technology that requires no rails. Now guests can really experience what it’s like to be a furry little rodent in a human-sized world as they dart quickly from hiding place to hiding place during this zany culinary adventure. 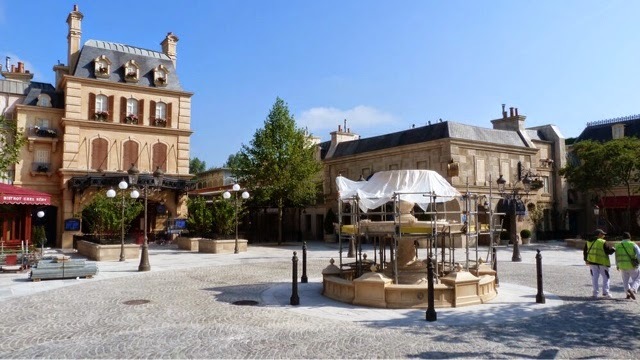 The new attraction, Ratatouille L’Aventure Totalement Toquée De Rémy, will be located in a new area of Walt Disney Studios Park called La Place de Rémy in honour of the energetic “little chef” from the film and the city he loves, Paris. This new mini-land pays tribute to thereal City of Light while at the same time evoking the whimsical Paris seen in the film. Also on the Ratatouille-inspired menu is a restaurant, and not just any restaurant, butBistrot Chez Rémy, with a similar atmosphere and proportions to the restaurant experienced at the end of the attraction. Completing the mini-land, and arriving in the autumn, is a new boutique, once again paying tribute to France: "Chez Marianne – Souvenirs de Paris". The Paris of Ratatouille draws inspiration from several iconic neighbourhoods of the City of Light. Place Dauphine and Boulevard Haussmann particularly influence its architectural design. The colours of building façades and the entire neighbourhood are purposefully more intense than in real-life Paris. 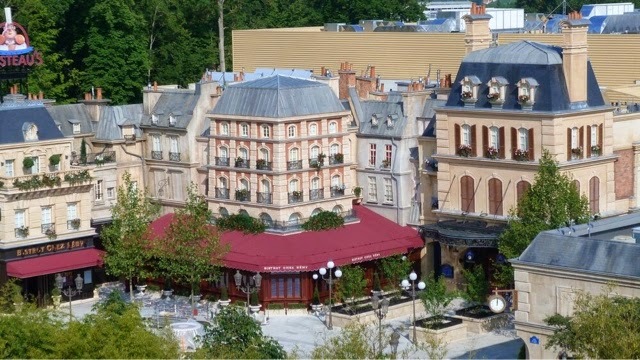 The Imagineers chose the Paris of the Ratatouille film world which is a valentine to the City of Light. The vitality of the film is completely preserved. One of the most important elements of La Place de Rémy is its fountain. Filmgoers saw a typically Parisian example in front of Gusteau's restaurant in the film. To recreate it in the Park, the Imagineers studied many Parisian fountains. The inspiration for our fountain was found in Place des Vosges, with its circular basins and lion heads spouting water. Once the shape and dimensions were decided, the designer Harley Jessup, who worked on the filmRatatouille, personally added the finishing touches that make reference to Rémy, his rat friends and the kitchen. Gourmet rats, of course, hold up sculpted bottles of freely flowing champagne. La Place de Rémy will include two main streets: Allée des Marchands and Rue AugusteGusteau. A tribute to the world's greatest chef, Paul Bocuse, who provided plenty of inspiration for the creators of Ratatouille, will be unveiled on the central square near BistrotChez Rémy. The lampposts and benches will also be typically Parisian. Thanks to all these elements created by Disney's Imagineers, guests will be able to stroll through Paris as it appears in Ratatouille. Fans will also be able to spot references to the film, such as Linguini's bicycle, Colette's motorbike or the Vespa stolen by the dreaded Chef Skinner. Delicious French cuisine, like that presented in the Disney - Pixar film Ratatouille, can now be enjoyed by all in Bistrot Chez Rémy, a themed table service restaurant inspired by the world and recipes of the film. The upscale, but light-hearted 370-person restaurant is the creation ofRémy, the rat who loves to cook, and is located in a new corner of Walt Disney Studios Park that's been transformed into a Ratatouille-themed version of The City of Light. Join us for lunch or dinner at Bistrot Chez Rémy from 10 July 2014. Bistrot Chez Rémy will welcome guests into a world where they are shrunk to the size of ratsimmersing them in an oversized world where jam jar lids serve as table tops and champagne corks are turned into chairs. Designed by Rémy and his friends, the restaurant also featureseveryday human items made large like paper cocktail umbrellas turned into parasols, giant cookbooks standing on end, and plates used to separate seating areas. On the menu during this Ratatouille-inspired experience, Rémy has prepared a unique menuthat includes entrecote, chips, and of course, ratatouille! The "little chef" recommends a seasonal salad to start and a choice of dessert: a selection of French cheeses, including Brie deMeaux, and a fruit salad. Bon appétit! Guiding Disneyland Paris guests from the dream of animated films to the reality of the Parks with their illusions intact takes more than the wave of a magic wand. It's all in a day's work for the Imagineers. This unique group of Creative and Technical people transforms the biggest animated films into immersive experiences you’ll find nowhere else. Walt Disney Imagineering was formed by Walt Disney in 1952 to plan, design and build Disneyland Park in Anaheim, California. Today, Imagineers are responsible for the creation, from concept initiation through installation, of all Disney resorts, parks, attractions, cruise ships and new entertainment venues all over the world. The Imagineering team includes planners, artists, designers, project managers, engineers, architects, art directors, audiovisual specialists, animators, production groups, programmers, site planners, financial analysts and researchers – more than 140 unique disciplines in total. But their work doesn't stop there: they also design and create restaurants, boutiques and hotels, in short, everything that contributes to "immersing" guests in the magic of Disney. The unique strength of Walt Disney Imagineering lies in its fusion of creative and technical talents, building new types of shows and entertainment inspired by Disney's dreams and stories. Thanks to their expertise, Ratatouille: L’Aventure Totalement Toquée de Rémy puts state-of-the-art technology to work, to bring the story to life. John Lasseter who not only directs the Disney and Pixar animation studios but also holds the position of Principal Creative Advisor with Walt Disney Imagineering, himself said, "I promise you that we will not only continue to make the best films, but also the best attractions." Rémy is a young rat who dreams of one day becoming a great French chef. Neither the opposition of his family nor the fact that he is a rodent stuck in a job he hates can hold him back. Rémy is ready to do anything to live out his passion for cooking, and living in the sewer beneath the restaurant of the top chef, Auguste Gusteau, gives him just the chance he needs! Despite the danger and traps he encounters along the way, the temptation to venture into this forbidden world is too great. Don't miss soon a new pictorial update on Ratatouille thanks to new great pictures by Max, D&M contributor! Les visiteurs découvriront un véhicule pour le moins inaccoutumé, qui leur permettra de vivre l’expérience à la hauteur des adorables rongeurs. Bienvenue à la « ratmobile » ! Un modèle complètement inédit que l’on ne trouvera qu'à Disneyland Paris. Dessinée spécialement par les Imagineers, cette curieuse automobile au design à faire pâlir les véritables rongeurs sera déclinée en cinq coloris. Un véhicule résolument familial puisqu'il pourra accueillir sixpassagers. La ratmobile se déplacera en groupes de trois. Mais aucune ne suivra exactement la même trajectoire, comme de véritables petits rats. Elles avanceront via une technologie qui ne nécessite aucun rail. Le public va donc vivre l'expérience mouvementée de ses adorables rongeurs indési-rats-bles,dans une aventure 4-D riche en effets spéciaux dans un monde totalement disproportionné.Une aventure gastronomique... rat-dicalement toquée. Un des éléments majeurs de la « Place de Rémy » sera sa fontaine. Les spectateurs ont pu en apercevoir une typiquement parisienne devant le restaurant de Gusteau dans le film. Pour la mettre en scène dans le Parc, les Imagineers ont étudié les fontaines de la Place des Vosges avec leurs multiples bassins circulaires et leurs têtes de lions déversant l’eau. Une fois la forme et les dimensions définies, le designer Harley Jessup qui a travaillé sur le filmRatatouille, a lui-même ajouté les finitions qui feront référence à Rémy, ses amis les rats et la cuisine ! Les rats gastronomes justement, brandiront des bouteilles de champagne sculptées qui couleront à flots. La « Place de Rémy » abritera deux rues principales : l’Allée des Marchands et la Rue Auguste Gusteau. Un hommage au plus grand chef au monde, Paul Bocuse, qui a largement inspiré les créateurs de Ratatouille, sera dévoilé sur la place centrale près du « Bistrot Chez Rémy ». Une grande Colonne Morris rappellera les théâtres de la capitale, mais avec des affiches propres à l’univers du petit chef Rémy! Les lampadaires et les bancs seront eux aussi typiquement parisiens. Grâce à tous ces éléments créés par les Imagineers, les passants pourront flâner pour la toute première fois dans le véritable Paris de Ratatouille. Les fans retrouveront également quelques clins d’œil comme la bicyclette de Linguini, la moto de Colette ou encore la Vespa volée par le redoutable Chef Skinner. Permettre aux visiteurs de Disneyland Paris de passer du rêve des dessins animés, à la réalité des Parcs, sans perdre leurs illusions ne se fait pas d’un coup de baguette magique. C’est le travail quotidien des « Imagineers ». Ce groupe unique de créatifs et de techniciens,transforme les plus grands films d’animation en expériences immersives uniques au monde. In France and the rest of Central European Time it is May 31st, 22:50 pm. Yes, but guess what, there are others countries than France on this planet ( you didn't think about that, did you? ) And where i am it's already June 1st. Will there be any opening ceremony or press preview for the ride? Yes, the only Disney Parks ride is Mr. Toad's Wild Ride.